lots has been said about google, so even if i say anythin..it would be plain repetition. If not plagiarism. Bhai log sach!! Now why am i( a happy go lucky nature.. ), who cares a damn of wht is goin on in out world, suddenly interested in google. Aah!! where is tht small idea of mine??.. Beneath my bed probably. Will have to sleep to get it!! 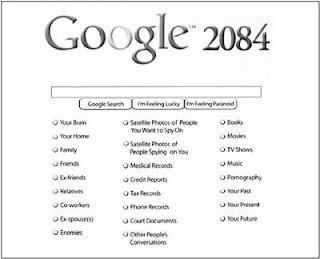 he he..
Anyways, watch this funny pic.. of the predicted frontpage of google in the coming decades!! !